Are you a comic tragic? A trivia fan? or just looking for a great night out with friends? 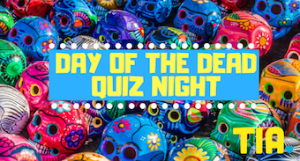 Come along to TIA’s most anticipated event of the year, our Annual Quiz Night. It’s going to be held on Friday, November 2nd, at Western Youth Centre, Marion Road Cowandilla. And that just happens to be Day of the Dead! At TIA we want our young people in Bolivia to celebrate their lives by helping them achieve their full potential as they transition from state-care into independent living. EARLY BIRD PRICES are available until midnight on September 30th for people booking tables of 8 or 10! Early Bird tickets are $20 per person, instead of $25. Book your tickets HERE.